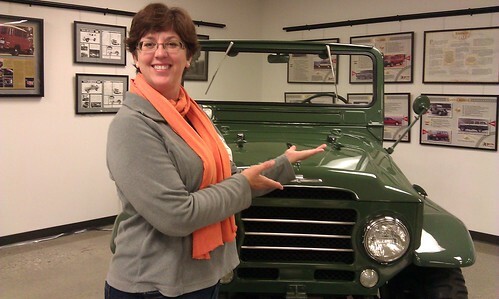 A Landcruiser older than I am in the Toyota Automotive Museum. And me, 31.6 lbs lighter than I was just 14 weeks ago. I went to Camp Toyota, but I did not knit seatbelts or sing camp songs, unless you count Lady Gaga’s “On the Edge” as I was scaring my fellow bloggers by attempting to manuver a giant Toyota Sequoia around corners (hint: you kind of have to wait for the back end to come around the corner before gassing it too hard). There were about 15 of us women from the Clever Girls Collective who came to Southern California to do a brand thing with Toyota. Not being a parent blogger, I rarely get invited to Brand Things, so I think it was cool of them to include me, even thought I don’t – *gasp* – have children. All of us bloggers got to know each other over some great food and wine when we arrived in Hermosa Beach Wednesday night, then went to work early Thursday morning learning All Things Toyota. No, not really all things. There are too many things to know – I’m lucky if I can keep their cars straight at this point, because, as it turns out, they make a car for pretty much every different type of person. They’re smart that way. But they gave it their best shot, explaining the product design lifecycle, their philosophy, their philanthropic efforts, their commitment to conservation and the environment, and they also did something kind of remarkable – they listened to us talk about cars, car shopping, and what we thought. Well played, Toyota people. Well played. At lunchtime, we spent two hours driving as many cars as we could. They lined up a bunch of brand new cars, left the keys in the cup holders, and told us to drive as many or as few as we liked, with or without passengers and with or without product experts to answer our questions. OK, YOU EVIL CONTROLLING SLAVE-MASTERS. I would have driven even more cars, but I got stuck in traffic. Well, first I got lost on the Toyota campus, THEN I got stuck in traffic with a broken-down tractor-trailer rig blocking four lanes of traffic. Scion IQ, the tiny four-seater that has all the techy stuff so you can sync your smart phone to your car. No, I’m not joking. Prius V and C – the Prius V is a hatchback. You KNOW how I love hatchbacks, right? And the C is cute as a button, especially in the Habanero color. It was cool to drive cars side-by-side and see exactly what they were like. I thought I’d LOVE the RAV4, but I don’t think I’d buy one after driving it. I’d save my pennies for the Highlander, which I wanted to marry. The Scion IQ was cute as hell, but it felt a little young for me. OK, a lot young. And even though I like to pretend I’m cool and edgy, I settled into the classic family sedan, the Camry LXE, like I was born to it. It was fun to be at Toyota. It made me nostalgic for work in a business that makes a product, because the people there were so dang proud. I miss that, working in a service industry. Ok, more about this whole adventure later. I’m wiped out! As someone who will probably need a new car in the next year or so, I appreciate this. Seriously. And I didn’t know there was a hybrid SUV. Glad to be of service. I’d love to put you in my pocket on the next test drive. I kind of want that old Landcruiser, but I think I should be looking at something more practical. I’ve got my heart set on a Soul. I don’t think I can afford a Toyota. The museum had some great cars. I wanted to try the Formula 1 out for size, but noooo. The haircut took 1 hour and 40 mins. I almost lost my mind. But I like it, too. You look fantastic! And I am kind of chuckling because back in the 70’s I had a boyfriend with one of those old Land Cruisers. My sis had one too. It was too cool. She even was in a Land Cruiser club. P.S. I’m a committed Toyota driver for years now. That Habanero colored Prius is mightly cute. But how’s the visibility in it? Is the hatchback better than the sedan? I didn’t have any visibility problems, but I only did about 10 mins in each car. Next time, I will look better. I had a Highlander for a few years, and it really was a great ride. I traded it for a BMW SUV, and almost instantly regretted it. Even though I have come to love the BMW, I still miss the Highlander. That’s saying a lot! Wow. That IS a good story. 2nd, we are looking at (and by that I mean, I keep returning to the local Toyota website and drooling over) a 2007 Camry XLE. Only problem is, it has 120,000 miles on it. Plan is to test drive it because everyone I’ve talked to says they last forever, so what’s the big whoop about mileage if nothing else is wrong with it. We’d be trading in our lone car, 2005 Camry SE, so we shall see. Neither of us have had a car with a sun/moonroof before so we’re tempted, especially as it would lower the monthly car payments by almost a third. So glad you got invited to this. Single women: we drive, too. I know. Maybe I can make a career out of being the token non-mom blogger.